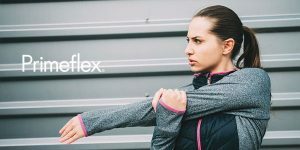 Friday, April 12, 2019 — Toray has added a new, innovative iteration to its PRIMEFLEX family of stretch textiles. By employing “Nanodesign” to control the cross-sectional shape of the composite fiber, Toray has succeeded in creating a microfiber PRIMEFLEX polyester. The result is a thin core-sheath structure and a fine comosite yarn with a single filament count of 0.8 denier or less. The result is a textile that hits the sweet spot Toray calls the “Soft-fit Zone”, ideal for the athleisure category, between the “Hard-fit Zone” of a fabric like Spandex and the “Loose-fit Zone” of reular textured yarn.